Spanning 15,000 light-years across and 180,000 light-years away, the Large Magellanic Cloud can be seen below the Milky Way in the southern sky. Inlaid to the right are three new sources now known to emit gamma-rays. Scientists have detected the origins of three bright gamma-ray signals from objects beyond our own Milky Way galaxy for the first time, including one signal from a strange "superbubble" of gas. 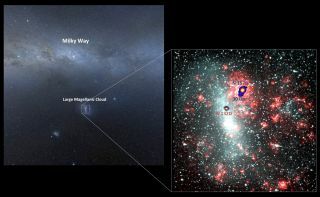 The gamma-ray signals from three very different astronomical objects were detected in the Large Magellanic Cloud (LMC) — the biggest satellite galaxy of the Milky Way — by a telescope network in Africa. They are spewing high-energy gamma-rays and are giving the Milky Way a run for its money. Two of the newfound gamma-ray sources, a pulsar wind nebula and a supernova remnant, are far more powerful than similar sources in the Milky Way. The third object, the so-called superbubble, is an entirely new source of gamma-rays in space, the researchers said. When gamma-rays slam into Earth's upper atmosphere, they emit a faint, blue light. Astronomers can then use this brief burst of light to trace the rays back to some of the most violent phenomena in the universe, including winds streaming off of pulsars and supernova remnants. In the new study, researchers used the High Energy Stereoscopic System (HESS) — four 13-meter (43 feet) telescopes in Namibia, Africa — to observe the largest star-forming region within the LMC. Over the course of 210 hours, the images lit up with a faint blue light, every photon revealing a single gamma-ray, traceable back to three distinct sources in the LMC. "So far, we only knew individual sources in the Milky Way, or observed emission from entire galaxies," Ohm told Space.com in an email. "This is the first time that we discovered more than just one stellar-type gamma-ray source in an external galaxy." All three sources are related to supernovas, the dramatic explosions of massive stars ending their lives. When a supernova explodes, the outer layers of the expanding material crash into nearby gas and dust, driving a tremendous shock wave. Electrons and other charged particles, accelerated in the rapidly expanding wave, emit gamma-rays. This image shows an optical view of the Large Magellanic Cloud, a dwarf galaxy neighor of the Milky Way, with H.E.S.S. telescope sky maps showing bright gamma-ray sources found in a new survey. The first source, PSR J0537-6910, is a pulsar — the dense, rapidly spinning remnant of a supernova explosion. Its wind nebula emits far more gamma-rays than its Milky Way counterpart, the Crab Nebula. One of the most studied celestial objects, the Crab Nebula used to hold the record as the brightest high-energy source in the sky. This newly discovered object, however, outshines the Crab Nebula by an order of magnitude. The gamma-ray source N132D is between 2,500 and 6,000 years old. It's considered a middle-age supernova remnant and yet is brighter than any of its galactic counterparts. On the same note, the researchers were surprised that they didn't detect the supernova remnant SN 1987A, which is the youngest supernova remnant in the local group of galaxies. But the most interesting source, scientists say, is the superbubble 30 Dor C, a massive shell of gas. Until now, astronomers had never seen gamma-rays of any kind from a superbubble object. "We are quite confident that these energetic particles are powered by supernova explosions, and probably a large part derives its energy from the fast-expanding shells created by these supernovas," Ohm said. "However, according to our current knowledge, these supernova shells do not have the right properties to accelerate particles to the very highest energies required. The shells are too small to do so." The High Energy Stereoscopic System is a network of telescopes in Namibia, Africa that can detect short flashes of bluish light created by gamma rays interacting with Earth's atmosphere. But 30 Dor C is far from small. Its cavity expands 270 light-years across and is thought to have been carved by multiple supernovas and strong stellar winds. It's now the first of its kind to be a known source of gamma-rays, and astronomers are fairly certain its large size is the culprit. The LMC's supernova rate relative to its stellar mass is five times that of our galaxy. The researchers think that its quick ability to turn over stars has likely caused it to breed so many extreme objects. Astronomers hope that high-energy gamma-rays will help them better understand cosmic rays, charged particles that whiz throughout the cosmos. The problem is that researchers still don't know where these particles, which are mostly protons stripped from hydrogen atoms, receive their energy boost. Because cosmic rays are charged, they feel the push and pull of any magnetic field they come across in space. So, by the time they reach the Earth, they're hitting it from all vantage points. But cosmic rays produce gamma-rays, which don't have this problem, so astronomers can use gamma-rays to probe likely sites of cosmic-ray acceleration. They've already linked cosmic rays to supernovas, but these results provide the first observational hint that superbubbles might also be a source of cosmic rays, Ohm said. A better understanding of the origins of gamma-rays and cosmic rays will further shed light on the dramatic stellar explosions across the galaxy and beyond.